Everytime you make a decision, you face two opposing gravity pulls. The pull is either for or against your decision. The systematic, organized, methodical way of getting into such a decision is called, force field analysis. 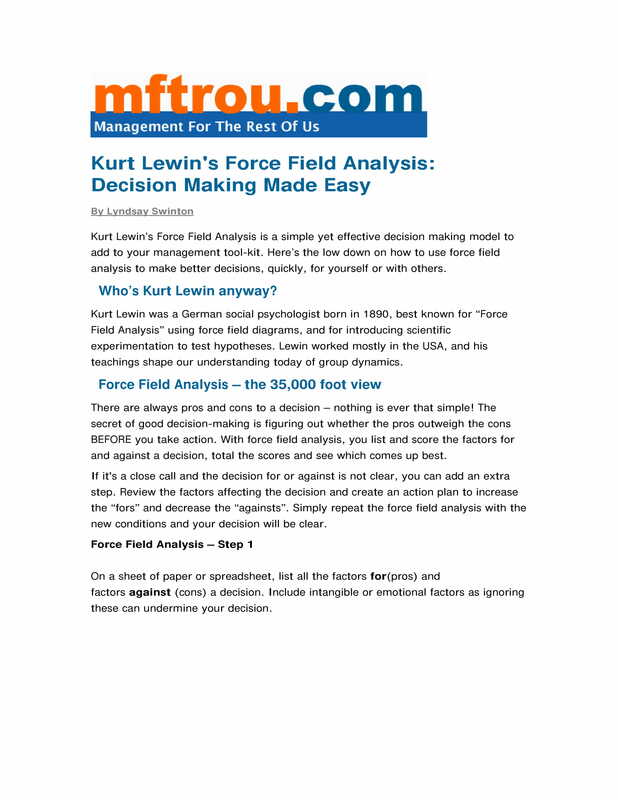 Force field analysis was introduced by Kurt Lewin. Originally it was used and intended for Social Psychology studies; now, it is widely used in business. 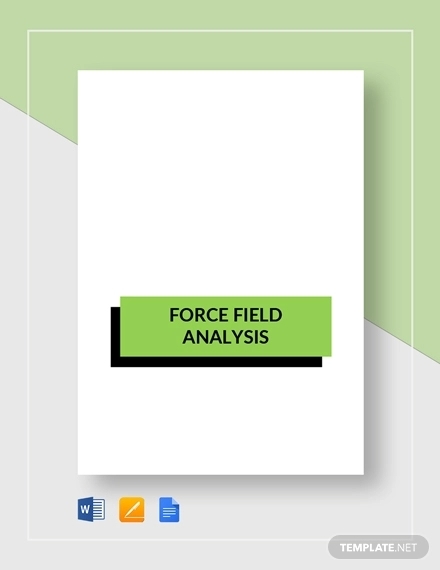 Originally, force field analysis is an attempt at looking at all the factors that can happen in an event. It tries to uncover the reasons how something is triggered. 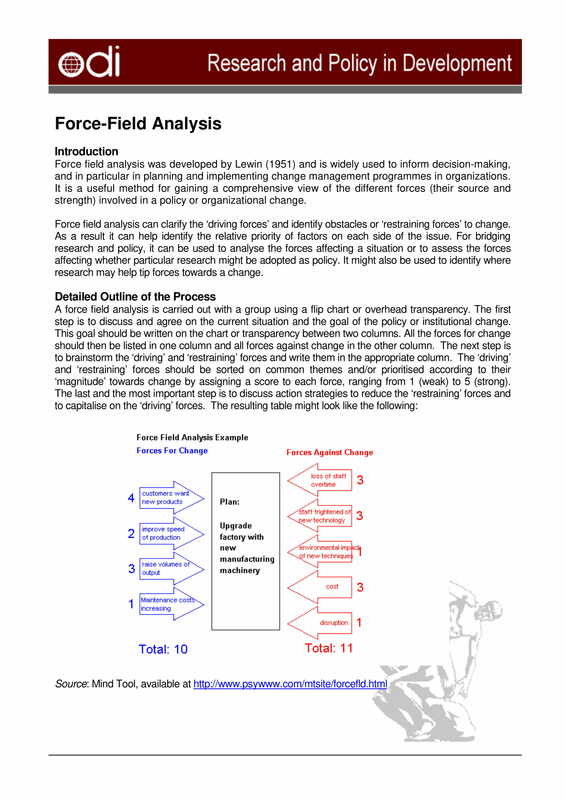 Kurt Lewin’s background on Psychology is very influential in how we viewed force field analysis today. We know Kurt Lewin as the founder of Social Psychology. That gives us a rough idea of what force field analysis means. It gives us the idea that a decision may not only be affected by the person itself, but by the society in which he belongs to. To understand better, let us make our example more specific. Let us use the scenario of a group of friends facing a decision whether to watch the latest movie or not. Let us leave it there for a moment and pick some theories from Kurt Lewin’s force field analysis. Stating the Problem. In the example given, you have a group of friends in the middle of making a decision making. The problem is whether they should watch a movie or not. Is it really a problem? It isn’t really a problem if all of them decides to watch, or not to watch. But the case becomes a problem if they do not have the same preference. What if the other member wants to stay at home? What if the other member want to watch another movie? What if one wants to watch a Dragonball movie? Determining Resistant Forces. Why watch movies? Why can’t we just watch other movies? Why that movie and not the other one? Why one of the members choose one over the other? In your thought, you will watch movies because it was a classroom requirement. And your friends may have another reasons such as, they are tired, or they do not want to watch superhero movies, et cetera. People. Each person has his own preference. Even within the family circle, there will always be differing opinions. Even for twins, there will always be a varying opinion. Habits. This is how an individual behaves within a society. In a school for example, there will always be someone who behave as if he does not belong to the school where he goes to. Customs. This is the acquired trait he gets from the tradition. For example, is it a custom for mountain people to go watch cinema from time to time? Attitudes. And this is where personality issues come in. For example, some people may be irritated when he they hear the word cartoon, or comics. The force field theory works by assessing how this problem becomes a problem. One direction is going this way. And another is going for that way. How are going to weigh these options? Weighing Options. This is the real beginning of the problem, when there seems to be many answers to a problem, when there should only be one. The Shakespearean Hamlet question is a classic example. How Hamlet tries to resolve the problem is very “force fieldian.” In the question, he is torn between dying and living. But the problem becomes greater as he weights all the consequences. If he should live, then he will face all the challenges, the pains, the sufferings in life. But if he should die, that is by suicide, then the consequences is far even worse. Here, Shakespeare is using (albeit unconsciously) the Kurt Lewin’s force field analysis. He is troubled by the questions: what happens if he die, what happens if does not. All this weighing approach to getting a decision is very force fieldian. But the most burdensome question that Hamlet is facing is the question whether he should avenge for his father’s death, after the Ghost told him of his killer. He did avange, but in procrastination, which probably caused the unnecessary deaths of some characters. Here is another classic literature that speaks about about a man facing two options, destiny. Two roads diverged in a yellow wood. He did chose one road, the one less travelled by. But did it mean something? Is the road that he took better than the other? It may not matter. What matters, is he made a decision. This is different take of philosophizing, and analyzing things, on choosing a decision. Kurt Lewin does touch the issue of weighing options. But Robert Frost’s The Road Less Traveled By, give more emphasis on the decision, rather than the kind or the content of the decision. Well, at least that is how we interpret it. Between Shakespeare and Frost, we can see an obvious difference. Although, Frost makes mention about weighing all the consequences between choosing either of the roads. But, he somehow takes it back, claiming that it may not matter which road we take, what really matters is that we take a road. Frost is less inclined towards that of Kurt Lewin’s Force Field Analysis. Balance of power. Investigate balance of power. Basically there are two forces when making a decision. It is usually the negative and the positive, or for or against (change). Who are the key players involved in the decision making? In Shakespeare’s Hamlet, there is one character aside from himself, Laertes, Gerturde, which is the Ghost. The ghost is very significant in the decision making of Hamlet, it acts like a catalyst of the play. 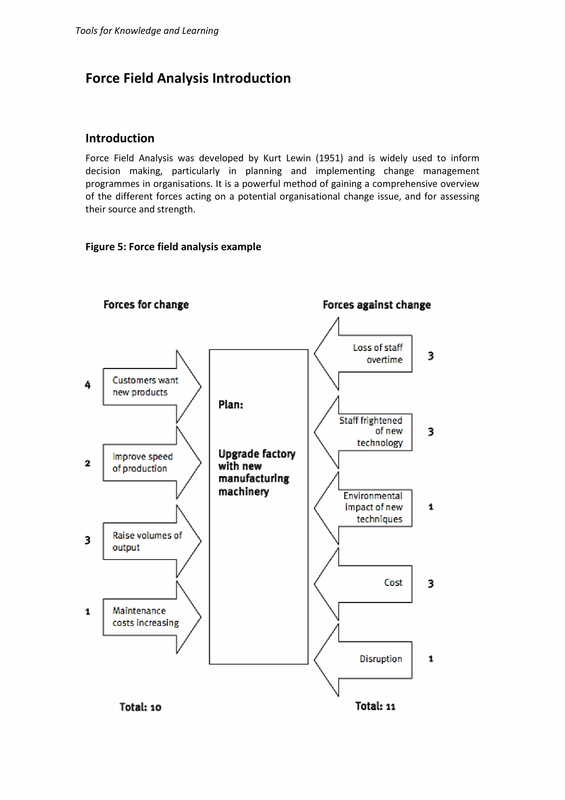 Check who and what is for and against change. In you group that plans whether you watch movie or not, can you identify who is for or against watching? 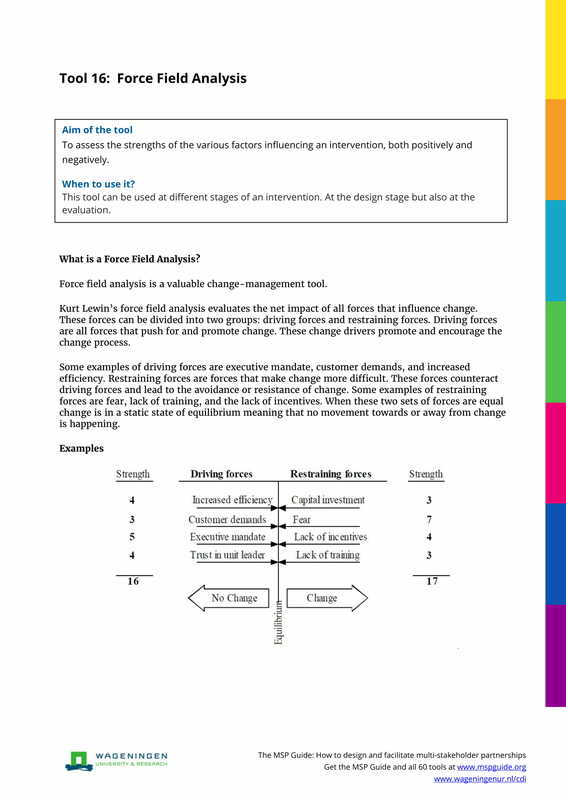 Identify methods to influence those against change. Is there a way you can influence those who are against watching movie to go watch with you? Maybe remind them that it is compulsory for your English subject. Qualitative. By qualitative, we try to measure points by the merit that it is good, regardless if they are many or not. For example, in the decision whether to kill someone or not, the decision not to kill, is the better decision (in most cultures). I does not matter if all the population decides that killing someone is the better option. Quantitative. With quantitative, it does not matter the kind of decision that you make, as long as there are number of people supporting it. All you need is a statistics, a vote. We are not sure where force field is commonly used. But if it has more leaning towards business, then the quantitative approach would be more effective. If it is for social study purposes, and especially when it deals with ethical values, the qualitative approach is the best option. 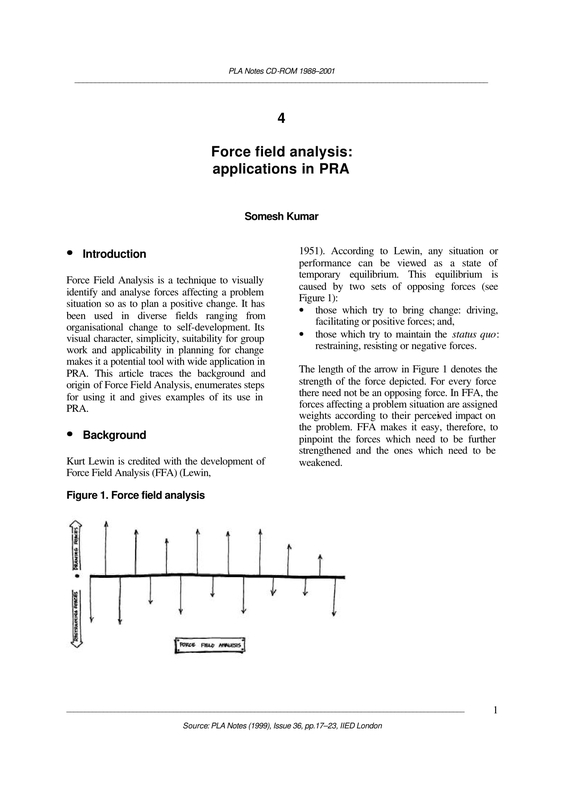 But it seems like there is no mention anywhere else about qualitative or quantitative when using force field analysis. Although Kurt Lewin was a social psychologist, he does not seem to border between social obligations and morality. It would be interesting to note that Kurt Lewin’s force field analysis reminds us that of Friedrich Hegel’s Aufhebung. It is a good contrast in that, Hegel would make use of to the idea “suppression”. The Hegelian dialectic can be expressed in this manner: there is a thesis, and an opposing idea will fight against it, called anti thesis. The resulting effect would become, a synthesis. The synthesis, eventually will become the new thesis. And the cycle goes on. Now what has this, the Hegelian dialectic, got to do with force field analysis? The biggest semblance between the two comes from the fact that both these methods is expressed in the dual force of nature. There is a presentation of two poles, a contrasting, opposing poles. Both methods can somehow be drawn and demonstrated in a Venn diagram, where in you have two opposing ideas, and they meet in between. And you come up with a decision, based on what is being presented. The strongest weakness in this method is that it is too polarized. In short, it demonstrates the world in only two opposing options. At least that is how you can see them in graphics. 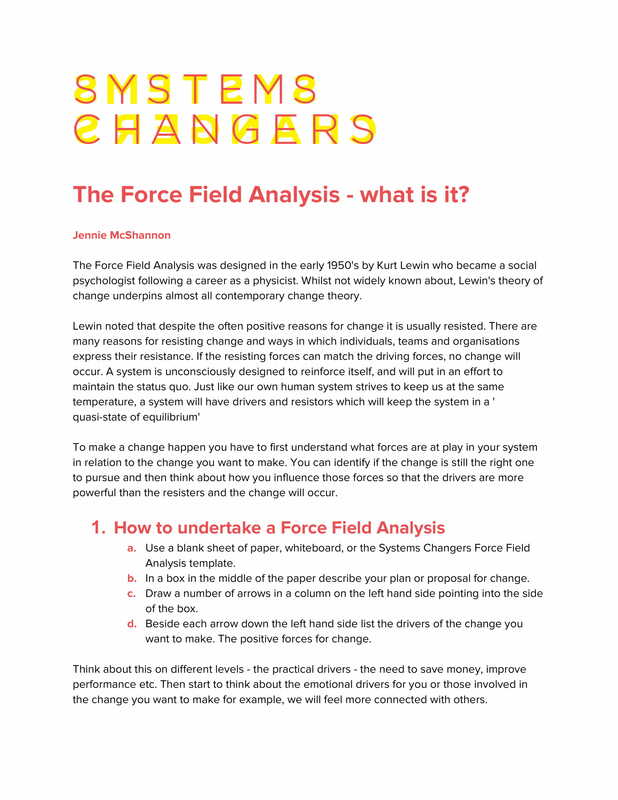 But originally, we know that from Kurt’s concept, force field is about methods of analyzing social conditions. And that means 3 dimensional, and even more. Is is about considering all aspects of a society, not just the “for” and the “against” of it. It is complicated. And it even becomes more complicated if you weigh them in terms of qualitative approach. 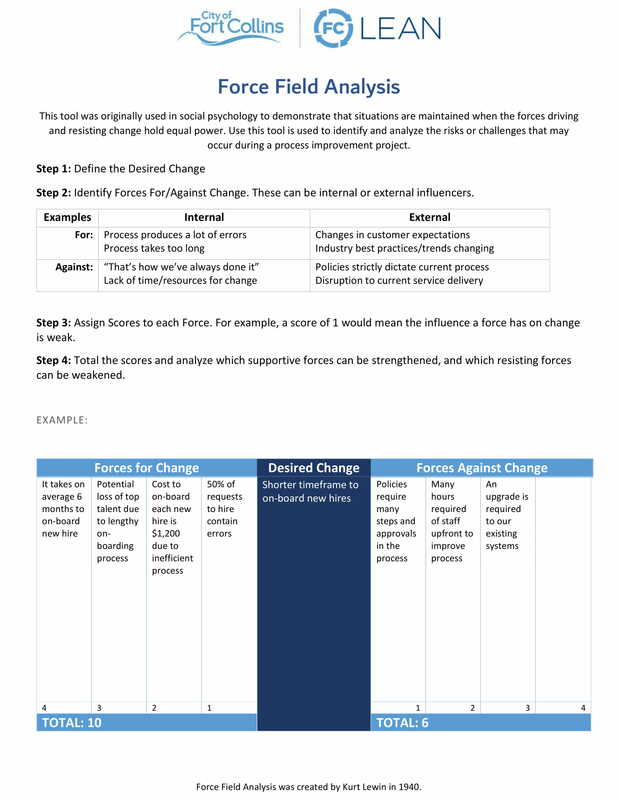 The best use of force field analysis is when an institution decides to do some changes. For example, a business institution might need to do a remodel of their edifice or office. And usually, the main reason or the drive that makes you decide to do a remodel is because your building looks old already. That is one side of the pole. And there are many other else. But there is also another side of the coin, the opposing pole. And this is usually the one that is disregarded. And what could be the opposing side of it, probably the cultural value of the building. That is jut one example. And there could be other reasons for opposing. In a force field analysis, one gets to see both sides of the equation. When you can visualize objects, of either sides, it is easier for you to place yourself, that includes how to handle things correctly. 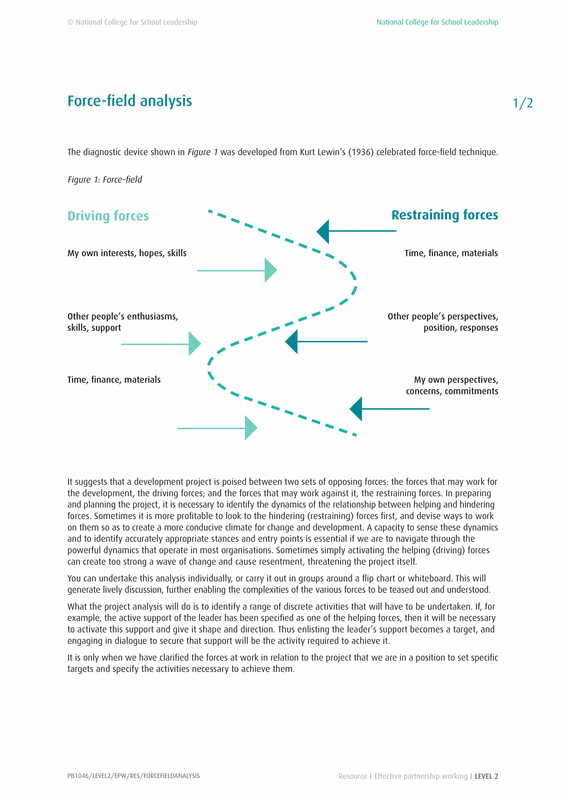 Force field analysis is not just about doing things, it is about making a documentation about something before making a decision. 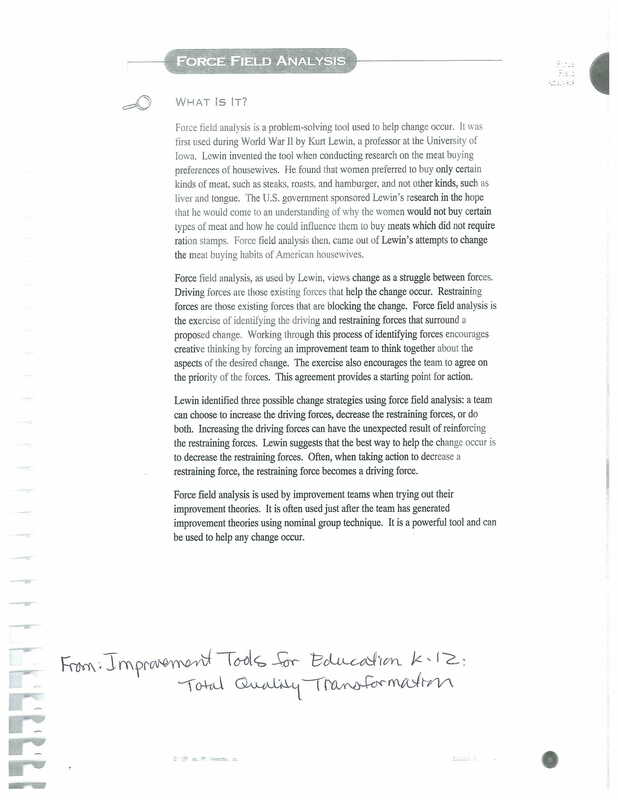 And that documentation is the putting things into order, that is by placing (1.) the subject, or the matter of the case in the middle, (2.) the negative on one side, and (3.) the positive on the other side. Now that you can see both opposing sides, you can identify obstacles. Identifying obstacles is very important as it is the beginning for ones realization to do something, to create solutions for the problem. One can only solve problem if he is able to identify the underlying problem. 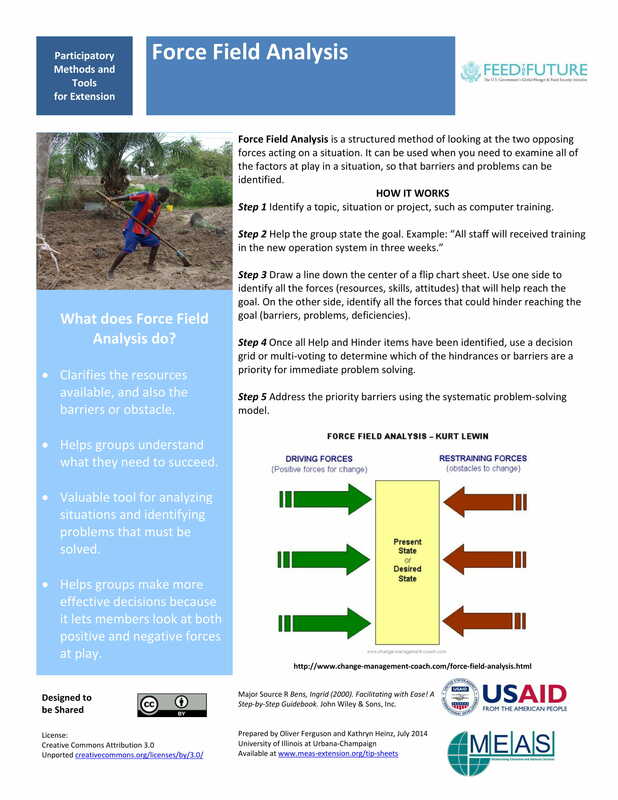 Force Field Analysis can be used as reference for the whole group thereby having a common point of view. Before a group could decide something, it is important that they have a common ground on which they base their reasons, their conclusion. It is like using only one kind, version of book in a debate. But force field analysis is not all bells and whistles, it has its own weakness, too. We already mentioned earlier that force field analysis tends to be a two sided theory, too polarized – the negative, as well as the positive. The problem lies not that it is only two sided, but the fact that, people may end up on either one side because there is no other option given, when in fact there should have been. In fact, the original idea of force field is very circular, as one can see in many movies, see force field at the battle of Wakanda in The Avangers Infinity War.